The Chocolate Croissant is a simple sweet treat that can be made in minutes. All you need to do is add chocolate chips or chop up some chocolate, roll it up in puff pastry and bake it. It’s that simple. Heat oven to 350 degrees F (177 degrees Celcius). Line two baking sheets with parchment paper or non-stick baking mat. Beat egg in a small bowl with a fork or whisk. Then set aside. Lightly flour your work surface. Take the puff pastry sheet and lightly dust the top with flour. Using a rolling pin, roll the sheet slightly to make it thinner. Then cut the pastry square into half. Take one half and cut into three pieces. You will get three rectangles. Do the same for the other half. All in, you will get six rectangles. Now, cut each rectangle diagonally into two triangles (making 12 triangles). Place about 1 tsp of the chocolate chips down the centre of each triangle. Then, starting at the wider end, roll each triangle up. 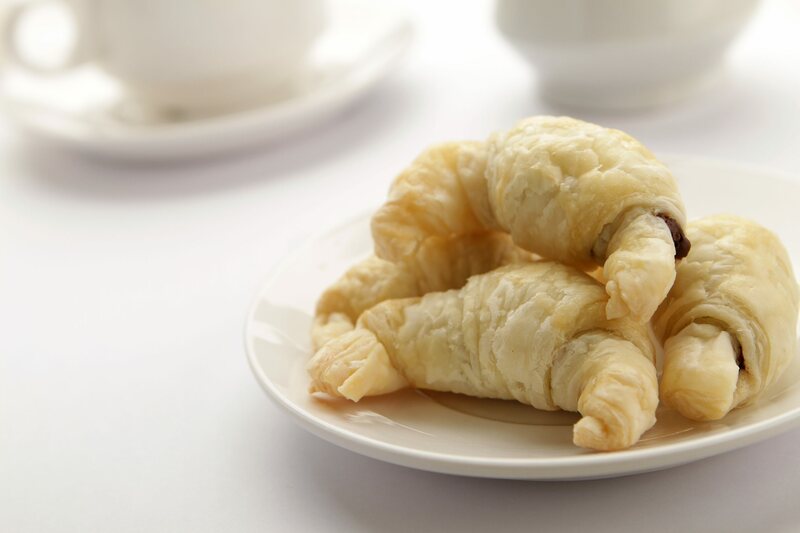 Place each croissant seam-side down so that the tip of the triangle is tucked under the rolled croissant. Then, bend in the edges, creating a crescent shape. Lightly brush the top of the croissants with egg wash.